In the small mountain village of Cornelli, in the Municipality of Isola di Fondra (BG), in Alta Val Brembana, this historic building dating back to 1600, of 175 square meters, is on sale, consisting of a ground floor kitchen with fireplace and terracotta wood stove; on the first floor of a double bedroom and bathroom, heated by a wood stove; on the second floor from a spacious room with terrace. Barn and wood storage at the back are refurbishing spaces, while on the ground floor there is an old vaulted cellar. The building is located on the CAI 125 path that connects Fondra, Pusdosso and Torcola Soliva. It is 5 km from Branzi and 20 km from San Pellegrino Terme. 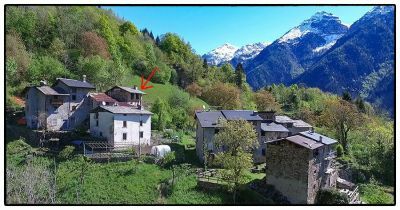 It is possible to know the events of the village looking for information on Amici di Pusdosso, an association dedicated to the recovery of the area.